The Whirlpool Suite was a real treat after a very long day. Great job, we were very impressed! No matter the time of year, there is always a reason to celebrate. From concerts to iconic holiday celebrations, wine and food festivals, casino and more, Brantford Best Western has something for everyone each and every season. Book the best packages. Book a family staycation at the Best Western Brantford. Fun for the whole family. Escape the March weather with the Family and stay with us at Best Western Brantford. Start your day right with our full breakfast buffet after a relaxing stay. At Best Western Brantford Hotel & Conference Centre, you benefit from comfortable, spacious rooms and suites, convenient amenities, and a warm, friendly staff to see to your every need. Welcome to your home away from home. Our accessible rooms feature extra-wide doors, access ramps, roll-in showers, and more. With our pet-friendly rooms, there's no need to leave your furry friend behind. Enjoy complimentary high-speed wifi in your room and in the hotel common areas. 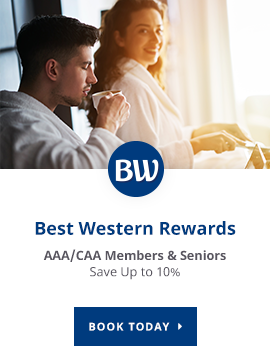 Sign up to stay informed about upcoming events, promotions, and packages from Best Western Brantford Hotel & Conference Centre. Please Note: you can opt out of our newsletter at any time. ©2002-2019 Best Western International, Inc. All Rights Reserved.